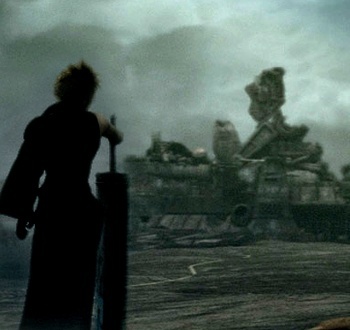 Is Final Fantasy VII's Midgar Poignant or Just Depressing? Is Final Fantasy VII a classic because of the dystopian city of Midgar or in spite of it? For all my happy memories of the game, there is nothing joyous or pleasant about its starting area. Midgar is awful - a grey disc of urban blight, where great factories belch pseudomagical soot into the air and everything is overcast by the sickly green glow of the Mako reactors. It's telling that the game begins by panning down to the city from an overhead shot of space; it is a place as alien and inhospitable as the dark side of the moon. It may have been beautiful once, a city of tomorrow. But in Midgar, "tomorrow" was a long time ago. As people bustle numbly through the streets, you catch a glimpse of a theater marquee announcing a new play: Loveless. The word stands out, as if an indictment. To live in Midgar is to loathe it. It is perhaps the vileness of the city that strikes a chord in so many player's hearts when they play Final Fantasy VII. Seeing the evil that can be wrought when the very lifeforce of the planet is used to fuel industrial wealth is a core theme in the game. Read the rest of Get the Hell Out Of Dodge and tell us whether you think the bleakness of Midgar was a necessary element in telling the story that enthralled so many gamers.